Rapid fat-burning gives low carbers metabolic advantages the sugar-burners don’t have. And going very low carb or keto burns even more fat: stored fat in particular. What is Very Low Carb / Keto? Low carb diets change your metabolism so your weight loss is fat loss. Ketosis happens when net carb levels are very low, typically while eating 20 grams of net carbs (or less) per day. Ketosis is a coveted state for low carbers. Ketosis is where the magic happens. Many low carbers find they feel better when carbs are very low – 10 net grams or less (on average.) Everyone is different and discovers their own sweet spot. During ketosis, our body uses fat as its primary source of fuel because there isn’t very much glucose (sugar; carbs) available. Even though most of our daily calories come from high fat foods, we must burn the fat for energy instead of storing it. So, low carbers eat liberal amounts of fatty foods, yet continue to lose weight. Very low carb / keto meals can be savory or sweet, but they are always high in healthy fats, energizing and extremely filling. Going very low carb (and entering ketosis) curbs appetite even more. Ketosis places the body in a disease-fighting, anti-inflammatory state – which we love. 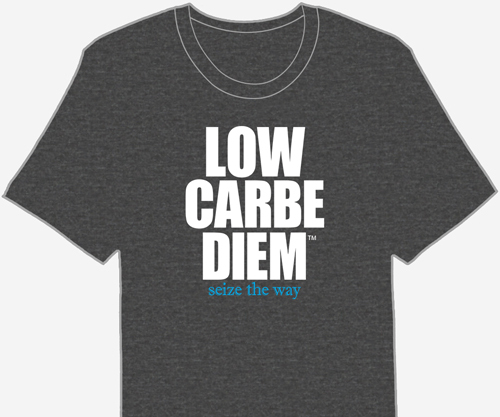 Eating low carb increases our ability to burn fats for fuel by lowering insulin levels in the body. Being in ketosis actually improves your body’s ability to do this more efficiently. When too many carbs are present, insulin encourages fat to be stored. Insulin has a lipolysis blocking effect, which inhibits our use of fatty acids for energy. On a very low carb diet, insulin is lowered and fat-burning abilities increase even more. On low fat diets (eating high amounts of carbs), our bodies use carbs for energy first, then the fats. Unused, extra fats are stored. Unfortunately, unless our body is forced to utilize fat stores first, it won’t. Why? Our bodies choose the easiest method, but not always the best method for energy: sugar. Sugar is inflammatory and not a healthy choice. If we feed our body carbs, it uses carbs for energy. If we feed our bodies fat, it uses fat for energy. However, as long as sugary / starchy carbs are low, you’ll rapidly burn stored fat for energy. On a keto diet (in the absence of carbs) our body must become more efficient at burning fats. There is little or no sugar around, so the fat we eat (and store) is used for energy. Ketosis burns a greater amount of fat in the midsection (unhealthy, visceral fat). Burning belly fat is a favorite health benefit of most low carbers! Keto diets target this trouble spot beautifully, especially the “middle-aged middle,” as Dr. Eades points out on his blog. It actually takes more energy to burn fat: nine calories per gram versus the four calories per gram for carbs. In ketosis, your body is burning more calories by using fat for energy. Even the smallest daily caloric deficit will open access for stored fat to be used as energy. Leo Tat of AuthorityDiet.com reveals the secret of using low carb for appetite control. And his infographic below beautifully illustrates the health benefits of ketosis. Although now a seasoned low carber, Leo Tat remembers vividly what happened when he went low carb. “I started low carb back in 2013. After a few weeks of adjustment, I noticed a significant change in my energy levels. Before, I used to struggle to keep my eyes open after lunch. Eating low carb, my energy and focus now remain stable throughout the day. After four months on a low carb diet, blood tests revealed my triglycerides and cholesterol were at optimum levels. There is solid evidence supporting the health benefits of low carb, but I have experienced them firsthand. It’s made a significant positive impact on my lifestyle. No one wants to be tired all the time! Our dietary health boils down to two pillars, what to eat and when to eat. What to eat is about the nutritional benefits/dangers of food and when to eat refer primarily to fasting. I write evidence-based nutrition articles (using scientific journal citations) to cover these two pillars. “Thank you, Leo!” for sharing your keto infographic with us! Leo’s infographic highlights the best health rewards of going very low carb or keto. We talk about weight loss, fat loss and getting healthier, but we rarely hear others mention addictive foods. Very low carb and keto diets remove addictive foods, suppress appetite and prevent overeating from cravings. The Standard American Diet focuses on addictive, sugary / starchy food groups. Eating these inflammatory foods causes additional hunger during the day, and unnecessary snacking or binging. Formerly “medical” low carb and keto diets enter the mainstream picture, freeing us from the snack-binge cycle. We can enjoy rich, filling (guilt-free) meals when our bodies need energy. We aren’t nagged by carb-induced hunger. We eat less overall, and stay full for longer periods of time. One way low carb diets help with weight loss is by suppressing our appetite. A common reason why it’s hard to diet is hunger, particularly when you reduce your proteins and fats. It’s no surprise most diets fail. No one enjoys being persistently hungry. Can you imagine being on a diet without the hunger, yet still lose weight? Well, that what happens on low carb! Low carb and keto dieters avoid the pitfalls of sugar addiction and over-eating / excessive snacking. They naturally consume fewer calories than those eating a low fat diet – without even trying. There are several reasons why you are less hungry in ketosis, but at its root, going on a low carb diet changes your macronutrient ratio. The ratio above is for a typical low carb diet. As you can see, with the carbohydrate content reduced, you consume more fats and protein. In turn, protein increases satiety. By eating low carb, your protein is moderate (15-30%) and your fat intake is higher (60% or more). The premise is to get your body into a fat burning state (ketosis), which allows you access to body fat as an energy source. Those on low fat diets need to restrict their calories because of hunger. 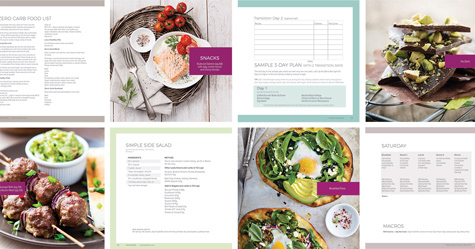 On low carb and keto diets, you’ll be so satisfied after and between meals that you can keep on track without counting calories. Sugar is highly addictive! Studies demonstrate sugar triggers the same chemical and behavioral changes in our bodies as addictive drugs (like cocaine). The addiction causes you to snack on more foods high in sugar. With a low carb diet, fewer carbs are consumed and thus, less sugar. By eating less sugar, addiction isn’t present to tempt you to snack. If you’ve stalled or reached plateau on other diets, metabolic syndrome may be to blame. Metabolic syndrome is a cluster of conditions (high blood pressure, high blood sugar, excess abdomen fat, and abnormal cholesterol levels) that occur together, increasing your risk of heart disease, stroke and diabetes. Going very low keto by making subtle changes on your plate places the control back in your hands. Despite popular myths, very low carb keto diets boost HDL cholesterol levels and reduce LDL cholesterol in the blood. Very low keto diets manage and control insulin levels with low sugar whole foods. Many diabetics (like Steve Cooksey of Diabetes-Warrior.net) successfully reduce or stop their former “Band-Aid for symptoms” medication, opting for natural healing with keto foods instead. In ketosis, low carb dieters lose fat and do not retain excess water weight. The body appears thinner very rapidly: a great reason low carbers stay on their diets. Perhaps the best health benefit of going very low keto is protecting our future health and quality of life. Low carb and keto diets fight Parkinson’s and Alzheimer’s, and are commonly used to effectively treat Epilepsy, Rheumatoid Arthritis, and particular types of cancer. Simply being in ketosis is a powerful appetite suppressant, but dropping net carbs even more makes fasting easier. You’ll be healthier, experience a sparkling mood and clear mind, and have boundless amounts of energy. You’ll be concentrating on life – not your next snack.